Today The Brown Tweed Society is pleased to introduce and welcome new contributing partner Leonard Jacobs, Editor of The Clyde Fitch Report, who will routinely weigh in with news from the New York theater scene and ongoing arts issues. The tweet-or-don’t-tweet-at-the-theater discussion will no doubt continue, as we observed at the CFR at the end of July. 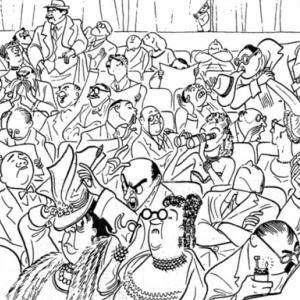 Despite the discussion (or maybe due to it), incidences of audience tweeting have become of increasing interest for me: During the last few weeks, I’ve scanned the twittersphere for any cases I could find and they’re more scarce than I thought in theater-heavy New York City. Are Broadway, Off-Broadway and even Off-Off-Broadway audiences chary of the local ordinance outlawing cell phone use in places of public gathering? I don’t know. But it’s hard to imagine that being the case. What I do know is that change is inevitable: As social media becomes increasingly intertwined with the American experience, it will become increasingly part of the theatergoing experience, too. As I suggested last month, the best thing the theater as a cultural force can do is to think proactively, to leverage social media, not dismiss it as more evidence of societal dysfunction. I know not everyone sees my point. Then there’s the question of social media for those working behind the proverbial proscenium. While the once-creaky Broadway commercial-producing model is largely embracing social media (profit incentivizes better than subsidy? ), my observation is that resident nonprofits, especially in New York City, are weaker in this area. Not unaware and not uninterested, just weaker. For one thing, everyone is not invited or authorized to tweet or Digg, etc. It is also a template that might benefit from a little tweaking. Visit Leonard Jacobs and The Clyde Fitch Report daily for for more posts on arts, theater and politics. Follow the Clyde Fitch Report on Twitter at @clydefitch.